After water infiltrates a structure there is a very short window of time to get the structure and contents dried out before the naturally occurring microorganisms begin to multiply and create a potentially hazardous mold situation. Mold can be hidden away in wall cavities and behind cabinetry and if not treated properly can be left to grow and develop into potentially dangerous situations including damage to the structure itself. Triad can quickly and efficiently address the problems mold can cause. Mold can affect the structure of your home or business because it feeds on organic materials, such as wood, paper, many fabrics, and even some types of glue, and eats away at these materials, causing them to rot and fall apart. 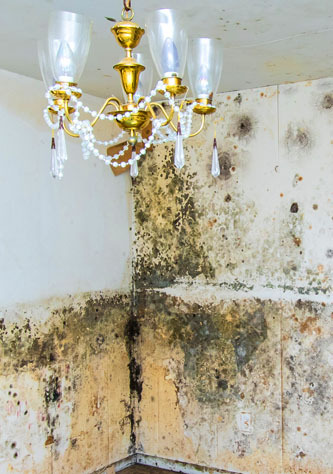 Mold can eat away at materials like wallpaper, drywall, carpet, wooden studs in walls, ceiling tiles, floorboards, and other structural components inside the home or business. If left unchecked, mold can even cause damage great enough to lead to structural damages to your home or business. If you discover mold in your home or business, it’s important to contact Triad as soon as possible so our team can assess the issue’s severity. Our experts will complete the required testing to determine the cause and extent of damages so we can provide you with a well educated opinion on what steps need to be taken to eliminate the issue.